The United Kingdom Directory of Marine Observing Systems (UKDMOS) is an online searchable metadatabase of marine monitoring conducted by UK organisations. This desktop application imports zipped archives from the UKDMOS database into SQL Server 2012 and converts the spatial data into SQL geometry layers. 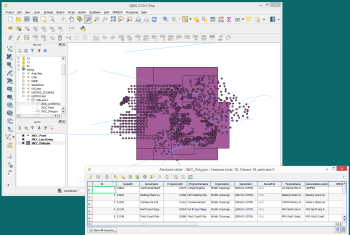 This allows users to run ad-hoc queries against the database and view the data as spatial layers in GIS software such as QGIS. The UKDMOS archives use the NERC SeaDataNet common vocabularies to indicate the parameters and disciplines relevant to each monitoring programme. The importer queries the SeaDataNet web services and downloads these vocabularies to provide context to the GIS layers by adding these parameters as attributes to the GIS layers. The work involved consultation with staff at JNCC and the British Oceanographic Data Centre (BODC) to ensure a faithful import and production of meaningful layers that are useful to JNCC marine staff when assessing the current extent of UK marine monitoring according to each, broad marine discipline (e.g. biodiversity, physical oceanography and fisheries). In addition, users can create custom layers, selecting only the monitoring parameters that may be relevant to a particular analysis.